Downey Daily has been posting about painted electrical boxes ever since we spotted the first one by the city library, but I only recently learned more about the program. 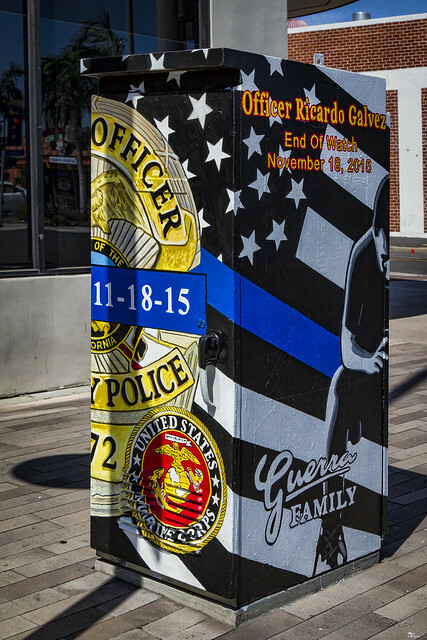 According to former Downey mayor Mario Guerra, the city implemented the program to paint and beautify the various power boxes throughout the city and later extended it to let organizations, non-profits, and even families sponsor a box. This box is the second of three boxes sponsored by the Guerra family. It honors fallen Downey Police Officer and Marine Ricky Galvez, who was killed in 2015.